New potatoes are not unique to Sweden, but their appearance around the third week of May is a sign that summer is around the corner. For a country where winter can be as long as seven months at the northern point, anything that heralds summer is a pretty big deal. So even though I’m not a huge potato eater, when I saw the new potatoes had arrived at the outdoor market at Möllevången, I was happy to see them. They cost three to four times more than regular potatoes but that doesn’t hinder people from scooping them up. 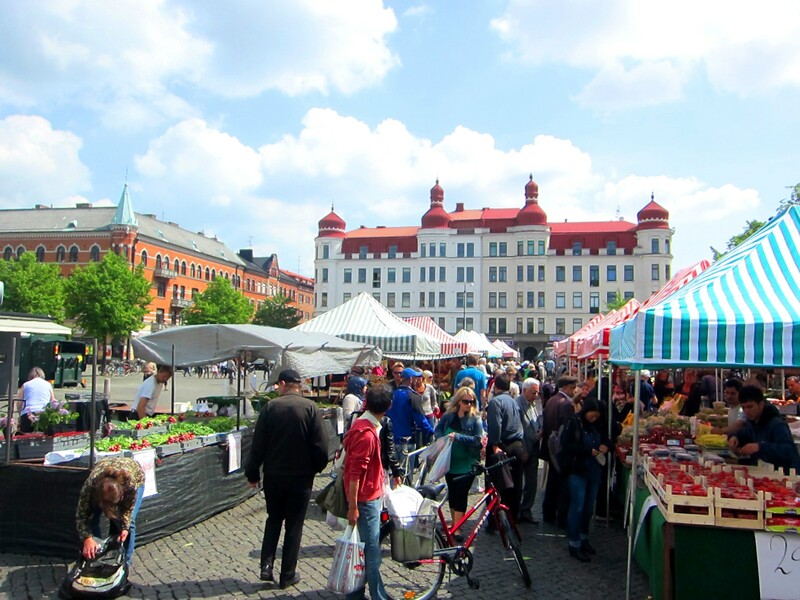 Potatoes in general are a significant part of daily Swedish food culture. Indigenous to South America, they made their way with the early explorers up through North America and over to Europe. They are documented in Sweden as early as 1655 in a botanical garden in the university town of Uppsala but they did not become a primary crop until the late 1700s. By 1820 potatoes had shifted from a food solely for the poor or alcohol production to largely replacing bread at the daily table. 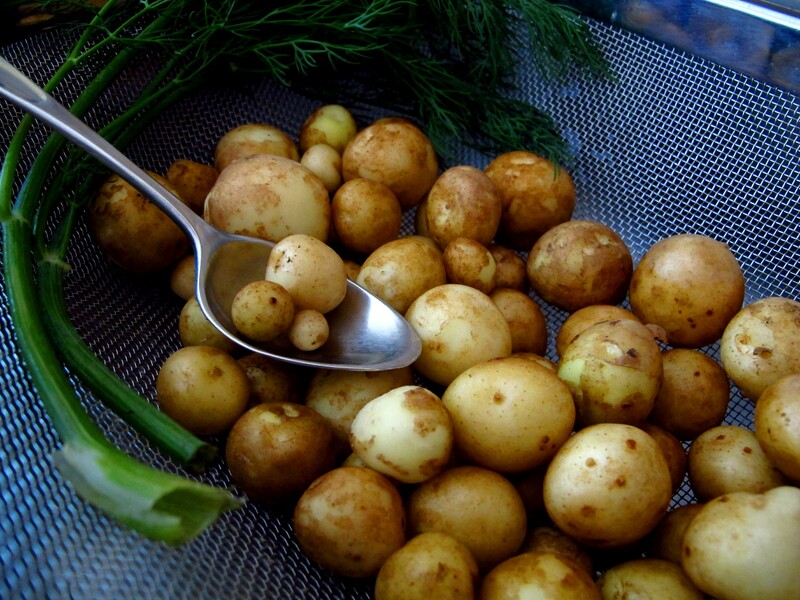 I purchased my new potatoes from the hand of the man who farmed them in Valåkra and the smallest spuds were the size of peas (that is a regular sized teaspoon in the photo). 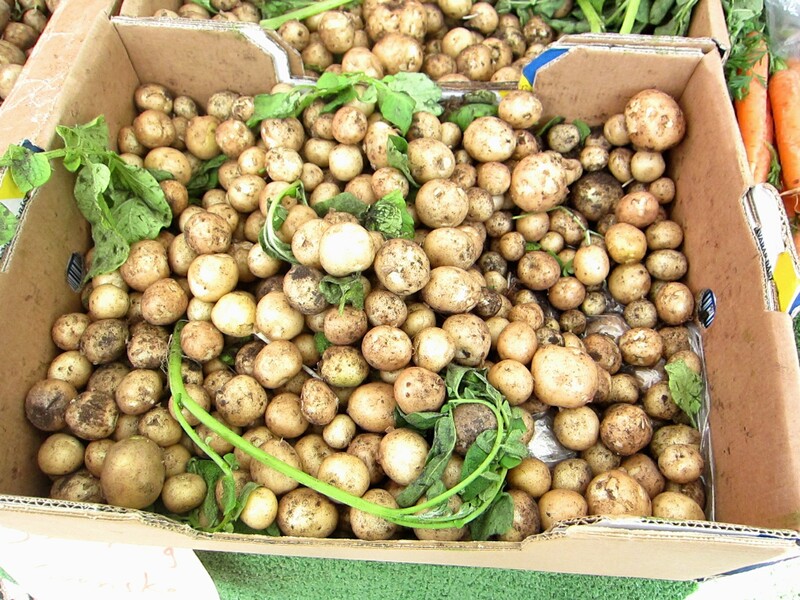 New potatoes are actually immature potatoes of any variety. They have a characteristically paper-thin skin and often arrive at the markets covered in dirt which helps to protect them from bruising and deterioration. Because they are immature, their sugars have not yet been converted to starch which makes for a high moisture content and a potato that holds its shape when cooked. It is best to use them within a few days of purchase and to leave them unwashed until you are ready to cook them. To prepare them, all you need to do is wash them off well and boil or steam them. You can remove any excess, papery skin by rubbing the potatoes with your fingers or brushing them lightly with a kitchen brush. Typically they are small and can be cooked whole. Simply place them in a pan of lightly salted water, bring to a boil and let cook for about 10 minutes or until tender. 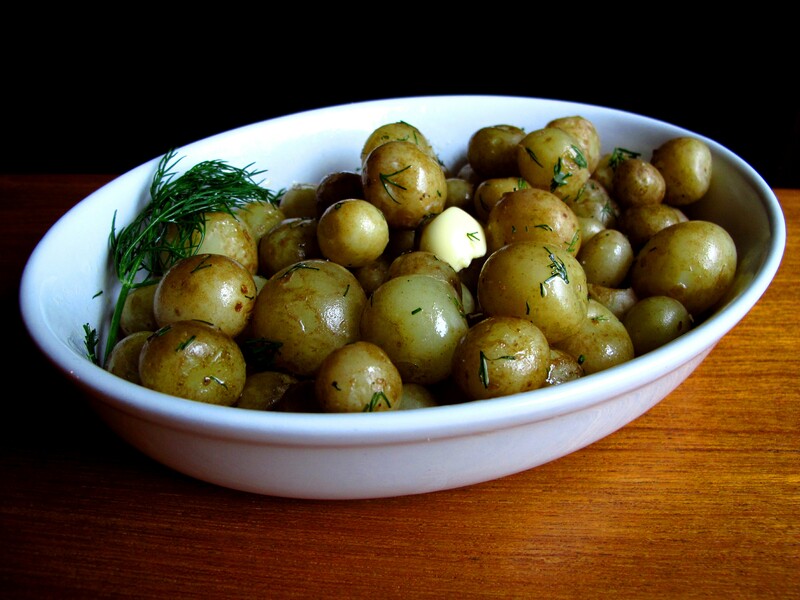 If you drain and dress them right away they will absorb more of the flavor from the butter or oil you are using and maintain their high levels of vitamin C. Because they hold their shape so well they are great for your favorite potato salad. Mine were swimming in a pool of butter with flecks of fresh dill clinging to them. Finally…summer is almost here.